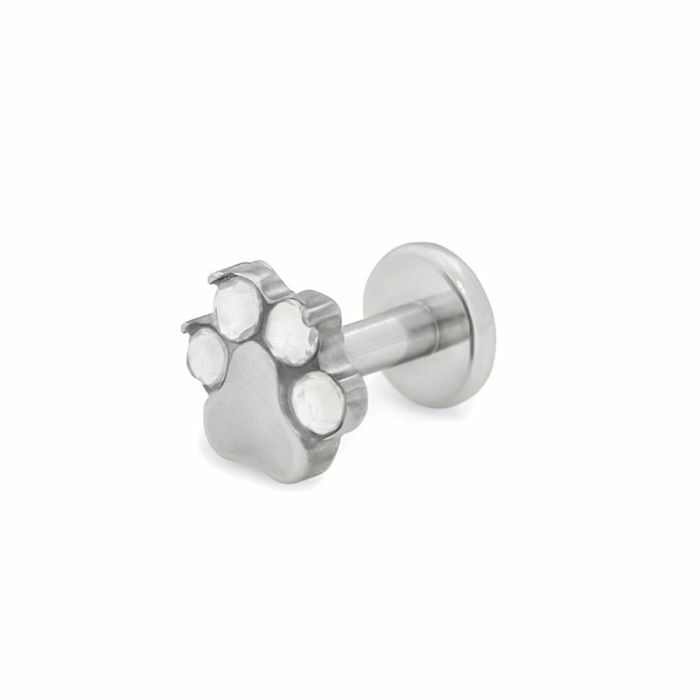 Devoted dog owners will love this paw print titanium top, which works with a variety of labret posts, barbells, and other basic body jewelry. This piece has internal 1.2mm threading and a 2mm long post, which is compatible with our standard 14g or 12g internally threaded body jewelry that has a matching 1.2mm internal thread pattern. It features four jewels set into a paw print design. The jewels come in your choice of Capri Blue, Light Rose, or Crystal. This top is made of high-quality titanium and, for a small fee, it can be anodized to one of 26 vibrant color options at our PainfulPleasures facilities in Hanover, Maryland.